Since testing positive for HIV, Curtis has careened between numbness and fear. Too ashamed to tell anyone, Curtis can’t possibly act on his feelings. And Luke–impulsive, funny, and more tempting than he realizes–won’t take a hint. Even when Curtis distances himself it backfires, leaving him with no idea how to protect Luke from the truth. Confronting a sensitive topic with candor and aplomb, acclaimed author J. H. Trumble renders a modern love story as sweet, sharp, and messy as the real thing, where easy answers are elusive, and sometimes the only impossible thing is to walk away. This was my third book by J.H. Trumble, and her writing style and stories continue to dazzle. Trumble isn’t afraid to tackle the tough stuff (affair with a teacher, anyone? 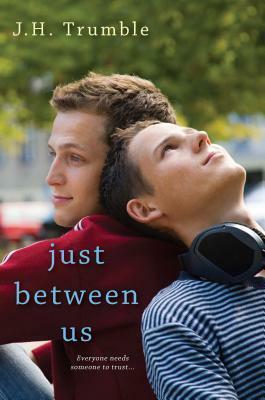 ), and she does it again expertly with this novel about two young guys, a budding love affair and HIV. The MCs in Just Between Us are Luke and Curtis. You might remember Luke as the harlot antagonist from Don’t Let Me Go. (You might also infer from my use of the word harlot that I didn’t much like Luke when I started Just Between Us. Sorry I’m not sorry?) Luke’s young—just 17—so I *guess* I forgive him for being a home wrecker. ;) And listen, the great thing about Luke is that he’s totally…devoted when he finds somebody he likes. I can also forgive him because Luke’s family is rough. While his mom and little brother support him, his dad is horrifically homophobic and just plain mean. I’ll put it this way: Luke’s dad is a kid’s worst nightmare to come out to. Curtis isn’t exactly old and wise himself. At 19, he’s returned home to the Houston area after a wild and crazy freshman year at UT Austin. Curtis loved hard and played hard while he was in Austin, and he’s about to get some pretty shocking news: he has HIV. Curtis gets the news just after things start to get serious between him and Luke, so naturally he pushes Luke away. It was painful to watch Curtis self-destruct. He had a supportive family, and I so wanted him to rely on and reach out to them. Unfortunately, he doesn’t, and he also delays seeking treatment for his disease. This was so heartbreaking and frustrating to read, but it also felt very real. I can imagine this might be the response of many who receive such a shocking and life-altering diagnosis, especially at such a young age. What didn’t work for me, though, was the extended angst fest. Like I said, Curtis’ response to his diagnosis was irritating (like, I wanted to reach into the book and shake him, more than twice). I got bogged down in both Luke and Curtis’ internal thought processes. I walked away thinking this was a solid, important read, but I also thought the book could have been a lot more effective with 50 or so fewer pages. I also thought both guys read significantly older than 17 and 19. Props for their maturity but…was it realistic? I’m not so sure. This entry was posted on June 11, 2014 by BioB in Reviewer: Jenni, YA / NA and tagged 3.5 Stars, HIV, jh trumble, kensington.